The executives chosen as 2013 Automotive News Europe Eurostars achieved success by exceeding expectations. 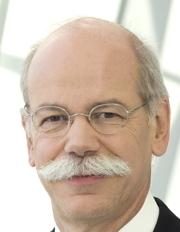 Daimler CEO Dieter Zetsche is this year's Eurostar winner for Group CEO. For his full profile please click here. The 14 Eurostars, who were chosen by the editors of Automotive News Europe, will be honored at an awards dinner on Oct. 1 in Paris.